Experience that wonderful glow in a ZAPP! 1. The promo is open to all active principal and supplementary PNB-issued credit cards in good credit standing except Corporate Cards. 2. Promo period is from February 1 to June 30, 2019. 3. Minimum amount for installment is P3,000. 4. 0% interest is subject to bank approval and valid if the total amount due is paid in full. 5. The monthly installment amount shall be posted as a regular transaction on the credit card account and shall form part of the total amount due. Should the cardholder choose to pay only a portion of the total amount due, but not less than the minimum amount due, the monthly installment shall be subject to the regular finance charges. 6. Cardholder may request to charge the full amount of the remaining unpaid principal amount subject to PNB’s approval. A processing fee of 5% of the total unpaid principal balance or Php 500, whichever is higher, shall be charged to the cardholder’s account. The unpaid principal amount plus the applicable fees will form part of the outstanding balance and subject to monthly finance charge. 7. All 0% installment transactions posted in the Cardholder’s account shall earn rewards points or miles. Rewards points or miles will be reflected in the SOA upon posting of the monthly amortization. 8. Failure to pay any two (2) consecutive minimum amount dues shall constitute default and the total outstanding balance shall immediately become due and demandable. 9. Cardholder acknowledges his/her liability to PNB for the installment purchases and will form part of the cardholder’s obligation to PNB. 10. The Terms and Conditions governing issuance and use of PNB credit cards are incorporated herein by reference and made integral part hereof. 1. Qualified PNB Cardholder may avail of the offers (freebies or discounts) when he/she uses his/her PNB card as payment in store. 2. Offer (freebie or discount) is not convertible to cash, points, miles, and cannot be used in conjunction with other PNB Credit Cards and partner merchants in-store promotion. 3. In the purchase of goods and services which are on promotional discount, the senior citizen can avail of the promotional discount or the discount provided under the Expanded Senior Citizens Act of 2010, whichever is higher. 4. Freebies can be redeemed until sixty (60) days after the promo period. 5. Promo is valid in single-receipt transactions. Click here to view list of participating branches. Per DTI-FTEB Permit No. 1826 Series of 2019. 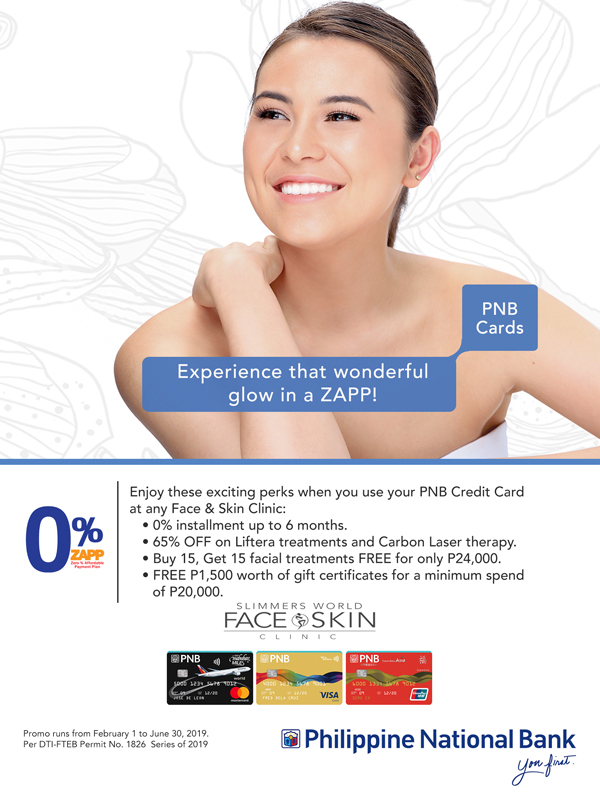 PNB Cards 24/7 Hotline (+632) 818 9818 / DTF 1800 10 818 9 818. PNB is regulated by the Bangko Sentral ng Pilipinas.